4C horizontal mailboxes that are wall mounted are U.S.P.S. Certified and meet STD-4C specifications, however installing 4C mailboxes on a pedestal for mail delivery requires local USPS endorsement. 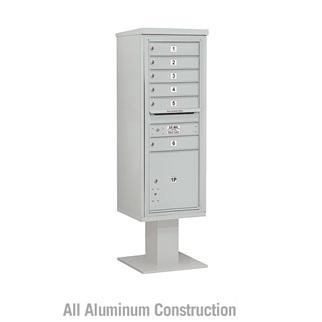 4C pedestal mailboxes include a compatible pedestal. USPS-STD-4C regulation demands a one package locker for every ten tenant compartment ratio. Mail receptacles are constructed of robust aluminum and stainless steel hardware and are guaranteed for indoor or outdoor use. Doors include a high security cam lock with a dust/rain guard and 3 keys. 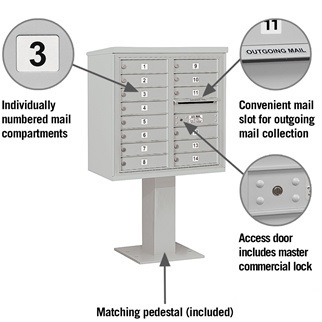 Mailbox compartment equivalent to two 3-1/4' high standard doors is utilized for outgoing mail collection & as a master access door and is identified with a decal marked "Outgoing Mail". The outgoing mail compartment includes a mail slot that is 10-3/4" W x 3/4" H and a climate protection hood. 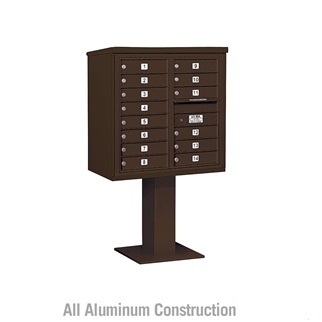 This pedestal mailbox is available in six powder coat colors and in front load only. Shop our large selection of pedestal mailboxes online now for local USPS approved mailing solutions.